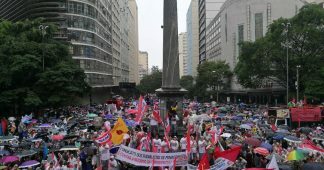 Amid record levels of unemployment and a terribly unpopular government, unions and citizens from all walks of life are taking part in one of Brazil’s biggest ever strikes. Since early Friday morning, more than 35 million people in Brazil have been taking part in one of biggest general strikes in the country’s history against President Michel Temer’s neoliberal reforms, bringing the country to a standstill.The strike was largely organized by Unified Workers Central, or CUT, the largest union federation in Latin America, and the Workers Party of Brazil, former President Dilma Rousseff’s political party.“Temer does not even want to negotiate,” said Vagner Freitas, national CUT president. Freitas estimated that the strikes would break previous records with more than 35 million people participating by leaving their work. In Brazil’s biggest city and economic hub, Sao Paulo, only one metro line was operating, 70 major routes were blocked off as was access to the city’s major airport. Before daylight, a number of protesters clashed with police while trying to occupy a vacant building. Police were also seen firing tear gas to disperse protesters and at least 12 people were detained. Similar scenes were also seen further South in Santos, where police reportedly used tear gas in an attempt to clear roads leading to the city’s port. In the city of Goiânia in central Brazil, police were seen violently breaking up protesters, with one man being forcefully grabbed and another shown bleeding. David Miranda, the first LGBTQ city councilor of Rio de Janeiro, was hit by a car during Friday’s protests after setting up traffic cones to block vehicles. The car stopped in front of Miranda and suddenly accelerated, toppling him and another protester. Both demonstrators were not criticially hurt. In Rio de Janeiro, the bridge between Rio de Janeiro and its neighboring city of Niterói was jammed tight with traffic for a number of hours in the morning. 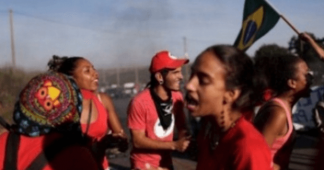 Large protests were also continuing in the Salvador the capital of the eastern state of Bahia, and in Curitiba in the southern state of Paraná and Belo Horizonte, the capital of Minas Gerais. #GreveGeral | Goiânia: Represión policial. In Porto Alegre, police also launched tear gas and smoke from fires lit on the streets billowed into air. Banks, schools and transport were brought to a halt in Florianopolis, Santa Catarina as police surrounding the crowds of protesters moving through the streets. Other cities across Latin America’s largest country are expected to have a similar fate. People are setting up road blockades, burning tires in the streets, and protesting the unelected government and its neoliberal labor reforms and austerity programs, with many holding signs of “Fora Temer!” (Temer Out!). In preparation, authorities have already boarded up state buildings in the federal capital of Brasilia and local Brazilian media is reporting that taxi’s and rideshare applications are offering people discounted fares to help keep cities running amid the strikes. In rural areas, locals were seen blocking off streets in protest using tractors. Dozens of other unions, grassroots organizations, teachers, church leaders, civil servants also threw their support behind the strike. “The idea is not making an action, but getting people to the streets and squares, stopping all production and services; transform cities into ghost towns” said Vera Paoloni, director of communication of the Single Confederation of Workers, in the state of Para, Vera Paoloni. 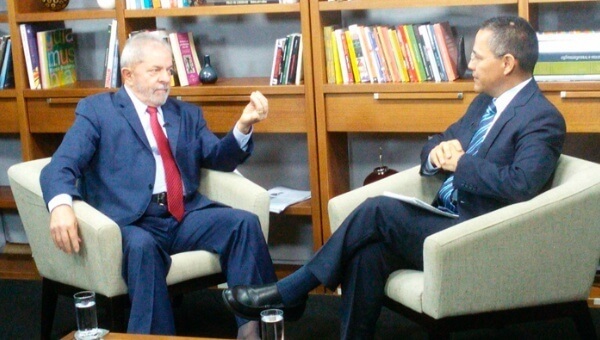 “Reforms of such importance can not be implemented without extensive discussion,” said Leonardo Steiner, the auxiliary bishop of Brasilia, in an interview published by the National Conference of Brazilian Bishops. The reform would undermine workers’ rights by eliminating payment for their commute from their contracts, reducing compensation for employer abuse, and most importantly, allowing employers to reduce workers’ salaries while increasing their work hours. The bill, which proposes to end mandatory union dues, must still be approved by the Senate. It was approved by Brazil’s lower house by 296 votes to 177. Temer is also proposing a 20-year freeze on public spending and cuts to pension protections. 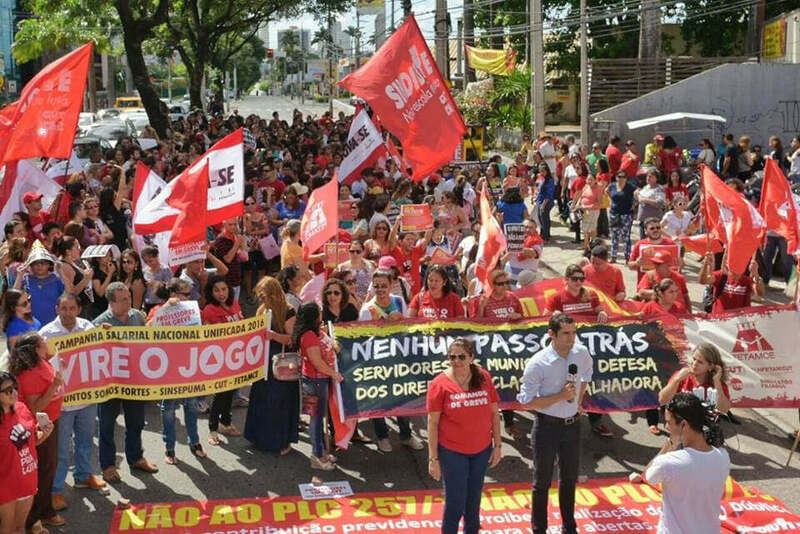 The general strike comes amid a dismal disapproval rating for the Temer administration — a staggering 87 percent, according to the latest Ipsos poll. 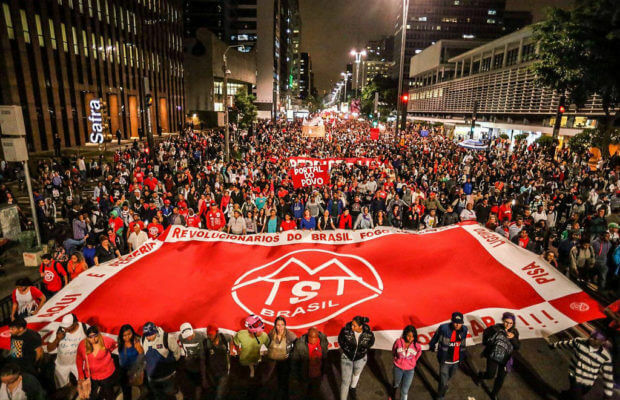 The mass mobilization of workers and civil society also comes on the heels of ongoing protests, such as the five-day encampment of Indigenous peoples and a police union protest, both occurring in front of Brazil’s Congress. “I invite all of you to participate in the strike, in an orderly fashion without chaos,” Bishop Flavio Giovanele, a strike organizer, told Brazilian news site Plus 55. Conservative leaders around the country have condemned the strike and threatened unions and striking workers with fines and wage discounts.